A lesson that we learned today: Share–so the both of us can have more room to eat other things. What a foodie thing to say. Day 2 we chose our restaurants much faster…a little faster. We did A LOT of walking…did we want to? No. It just happened. We walked from Chinatown to Voo Doo Doughnuts (that we did no wait in line for because…45 minutes for doughnuts ehh pass) to the riverwalk to the tram stop to the hospital up on the hill. What…were we thinking? I remember…It’s not thaaaat far we can do it. Anyway, where did we go that was notable??? The boyfriend stumbled on this place on Yelp (Good Taste Yelp Page)and the food looked delicious! So we made our way over to this place which I would have never found the front door to if he wasn’t with me. BTW, it’s a little door to the left of the restaurant. We came in and it was a bare space with a bunch of people slurping and shoveling food into their faces. We sat and ordered. Here is where we should have known better and SHARED a bowl of noodles and ordered a side of roasted pork or roasted duck instead of getting our own. 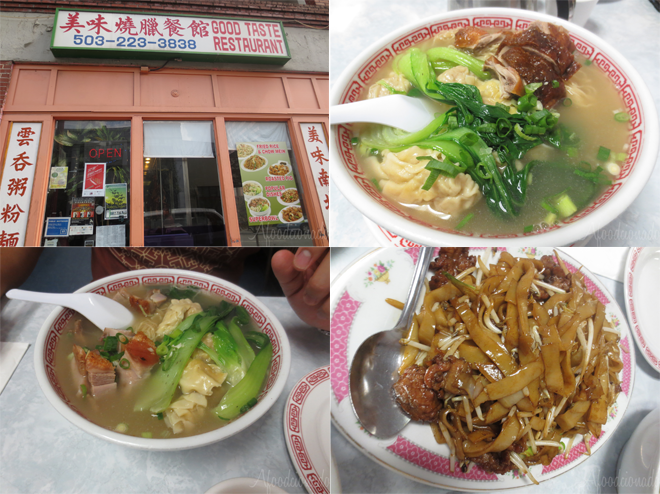 The portions were generous and the dumplings were as big as the ones in the pictures on the menu. DEEELICIOUS. The chow fun was pretty good nothing to write home about, and definitely unnecessary but pft we’re on vacation!! Vacation = gluttony. After our gut busting brunch we went on that walking adventure I mentioned above. We went to the waterfront, the top of the hill on the tram (If you have a Tri Met Week Pass it will not cover the $4 tram ride to the hospital, but a monthly pass will), then to the Portland State campus (why not right?!) , then back to our place in the Nob Hill area. Whew. 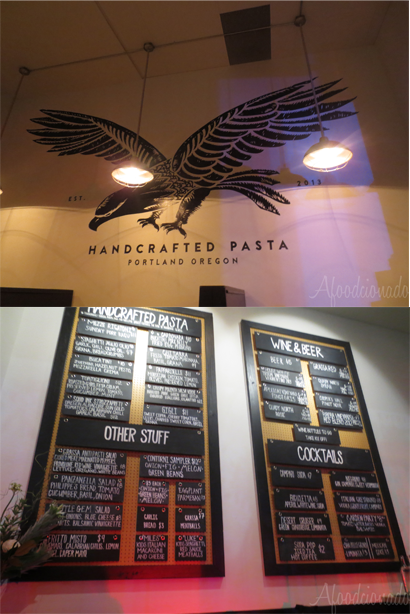 We couldn’t decide where to eat for dinner, but eventually settled to go to this handcrafted pasta place that I noticed yesterday. I was going to wait and experience it with my best friend and her dad when they got into town, but we decided to try it out first…why not! It was the BEST decision we made. Let me preface, Grassa has the best pasta I have ever eaten from the flavors, to the freshness, and especially the price. When confronted with the wall of pasta, I was set on trying the pappardelle, and I pointed the boyfriend to the carbonara since everyone was raving about it on Yelp. 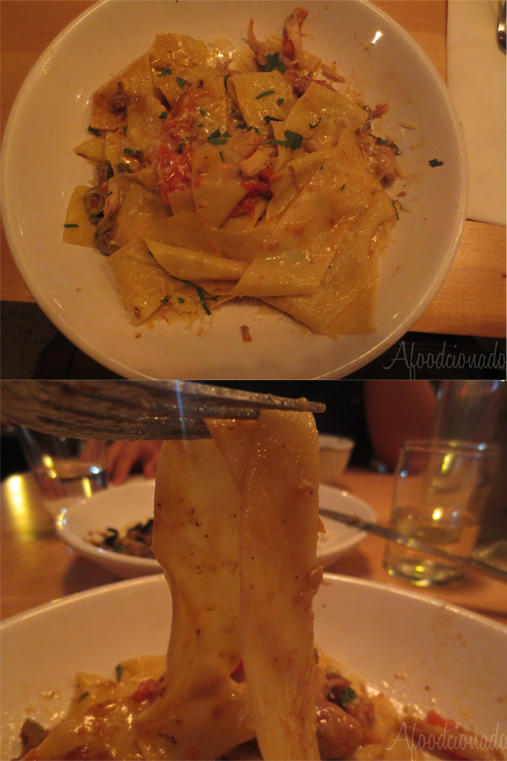 We also got the polenta, but lets just focus on the pappardelle at the carbonara… We found some seats in the communal seating situation they have there, and watched diverse groups of patrons eat. Then we got our food and forgot everyone else existed. Please excuse my boyfriends finger pointing at the bowl, he wants you to to LOOK AT IT! 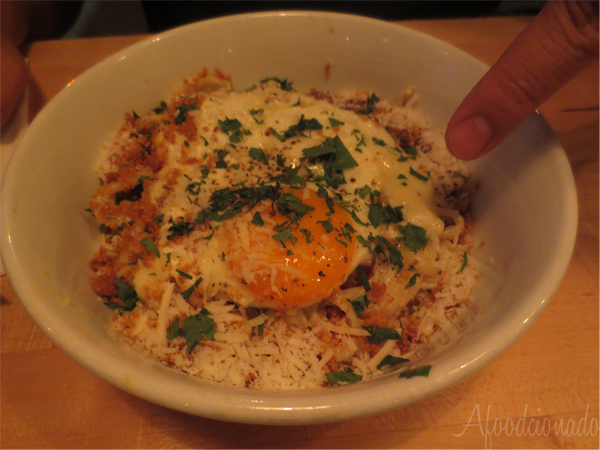 This bowl of handmade bucatini, crispy pork belly, mixed with pecorino, and that fried egg that is just waiting to be popped will make any carb fearing dieter binge on pasta for a few days. Once the yolk is popped it oozes and mixes into the pecorino and breadcrumbs to great this slightly salty amazingly rich sauce that lightly coats each of the bucatini strands. Amazing. You’ll keep swirling into your bowl until the sad moment when you realize it is all gone. HAND..MADE…PAPPARDELLE. Pappardelle has always been one of my favorite pastas probably because it is reminiscent of the wide rice noodles that I have always been fond of, and I have always been impressed with how thin something can be but still sturdy enough to maintain its shape and hold onto sauces and flavors. What made this dish great was that even though there was chicken and all these other flavors on the plate, the pasta was the star. Yes, the chicken was well seasoned , the acid from the preserved lemons was balanced by its sweetness and the sourness of the olives….but the pasta was the vehicle that brought all these flavors to you in one thin noodle. So. Good. After having our taste buds and minds blown at Grassa, we went down the street to Zeus cafe for some drinks and strolled to the street car stop and made our way back to our place in a pasta afterglow. Mmm.